« Day 35: Where’s my Feather Duster? Day 37: Would you like bread sauce with that? Cranberry Sauce is so last year. When I think of Christmas sauces, both Cranberry sauce and regular gravy immediately spring to mind. What I want to do this year is something completely different – but not too complicated. But tasty. And it’s got to be something my boyfriend won’t reject before even tasting it. (”Eww, I’m sorry, but I’m not eating that!” has been heard more than once in this household). 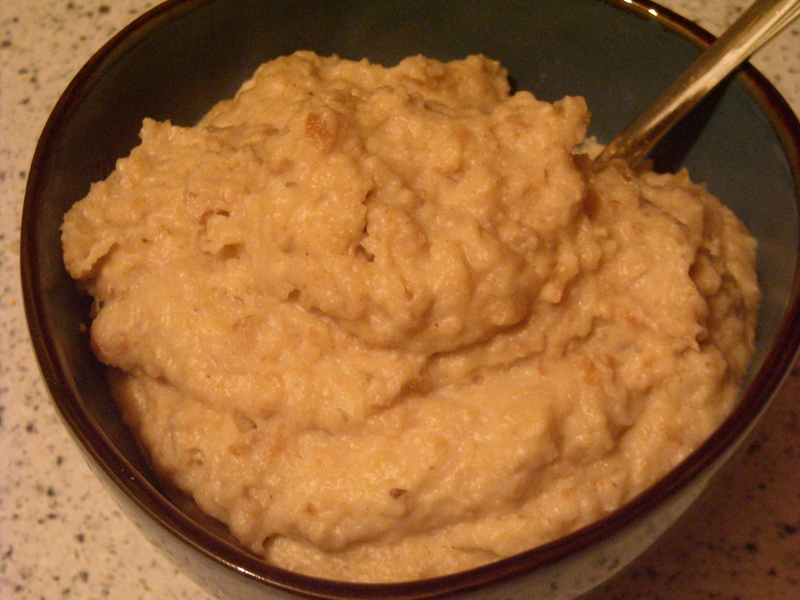 Bread Sauce: INGREDIENTS – 1 pint of milk, 3/4 of the crumb of a stale loaf, 1 onion; pounded mace, cayenne, and salt to taste; 1 oz. of butter. Mode.—Peel and quarter the onion, and simmer it in the milk till perfectly tender. 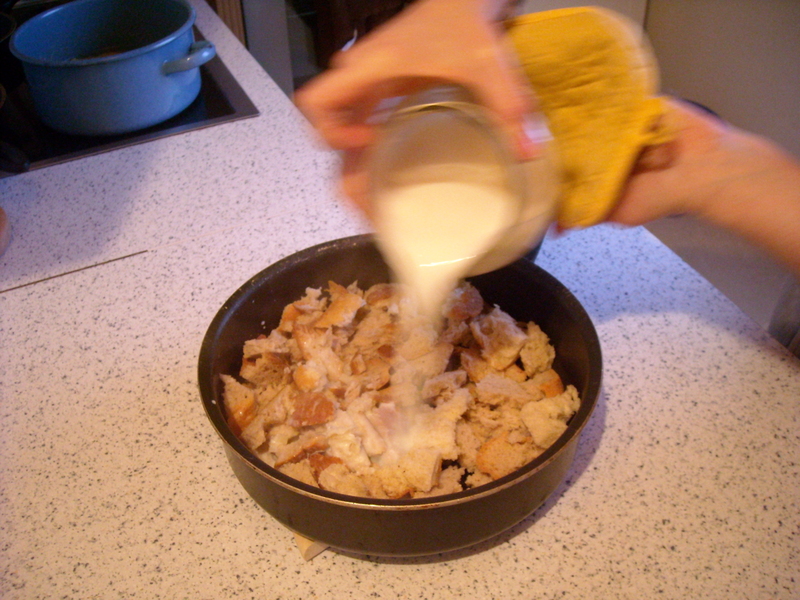 Break the bread, which should be stale, into small pieces, carefully picking out any hard outside pieces; put it in a very clean saucepan, strain the milk over it, cover it up, and let it remain for an hour to soak. Now beat it up with a fork very smoothly, add a seasoning of pounded mace, cayenne, and salt, with 1 oz. of butter; give the whole one boil, and serve. To enrich this sauce, a small quantity of cream may be added just before sending it to table. It takes no time to prepare (sure, the bread & milk mix have to be set aside for an hour, but the preparation time itself is nothing). I don’t have kitchen scales so I had to guess the weight of the bread – the sauce was not as liquidy as I guess it’s supposed to be, but that didn’t affect the taste one bit. 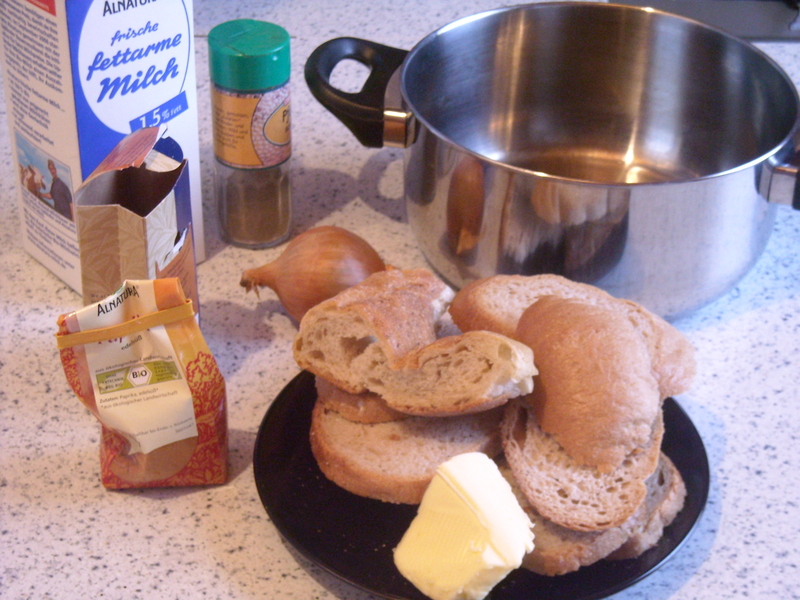 I substituted nutmeg for mace as I didn’t have any, and a mix of fresh and ever-so-slightly stale bread. The addition of cream at the end made a subtle but obvious difference – however, even without the cream it still tasted fantastic. We tried it tonight with our steak (vegetarian and non-vegetarian) and veg. Mmmm. Simple. Easy. Totally delicious. My boyfriend’s verdict: ”Hmmm, very nice. Very… bready. Nice!”. PS I tried this the next day with more milk added to make it look more saucy – even better. This entry was posted on December 24, 2009 at 7:58 pm and is filed under Christmas, food. You can follow any responses to this entry through the RSS 2.0 feed. You can leave a response, or trackback from your own site.